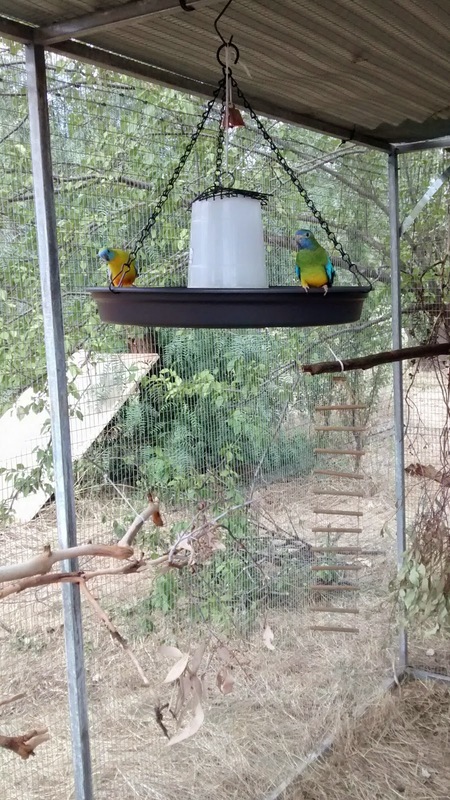 The aviary is finally finished, and Pip and Squeak are exploring it as I type. It's such a relief to see them have room to fly once again. 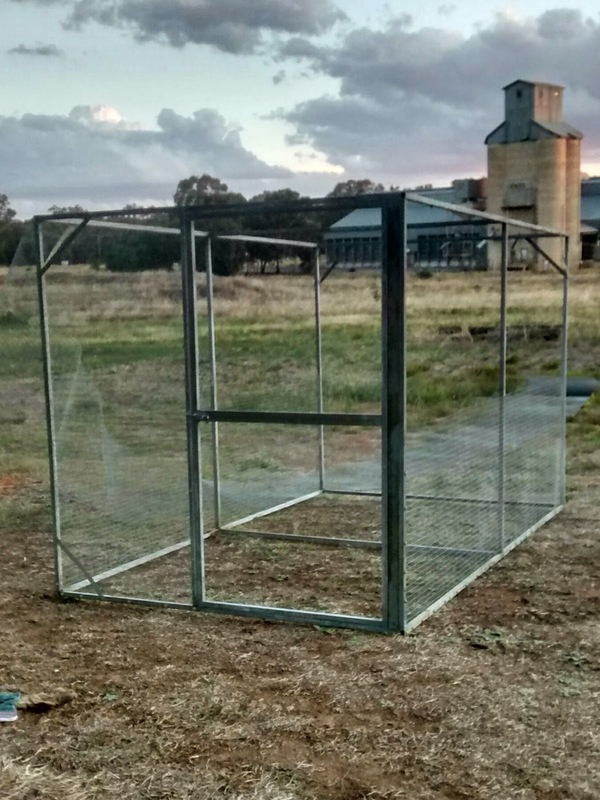 First, find out the sizes the wire comes in, and make the aviary to suit the wire. If we had have done this, we would have made the aviary about 2 inches shorter in height, and it would have saved us a bunch of work wiring it up! Secondly - the person selling the steel doesn't necessarily know much about welding the steel. Turns out the thin stuff we got (and recommended to "learn to weld" with) was a beginners nightmare according to most everyone else we spoke to after we purchased it! We mostly worked in the mornings and evenings when the weather wasn't too hot. Little birds in their cage, just before setting them "free". 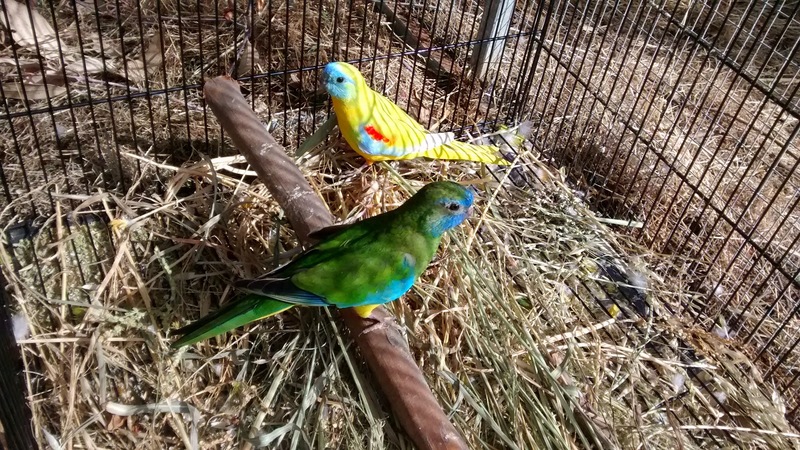 Pip is the green and blue girl in front, Squeak is the yellow, blue and red boy in the back. He has a quiet, shy personality, and a long trailing whistling song that ends in a high note. She has a more bold personality with a simple tweeting song. She rules the roost and certainly lets us know when she wants something special like more bird seed, or some fresh cut grass seeds from the garden! The first thing they found was the feeder, of course. Their new favourite place in the aviary! After that, Squeak found some bark that was extremely tasty, and quite satisfying by the looks of it. Pip found the log she could climb inside and started chewing at that. 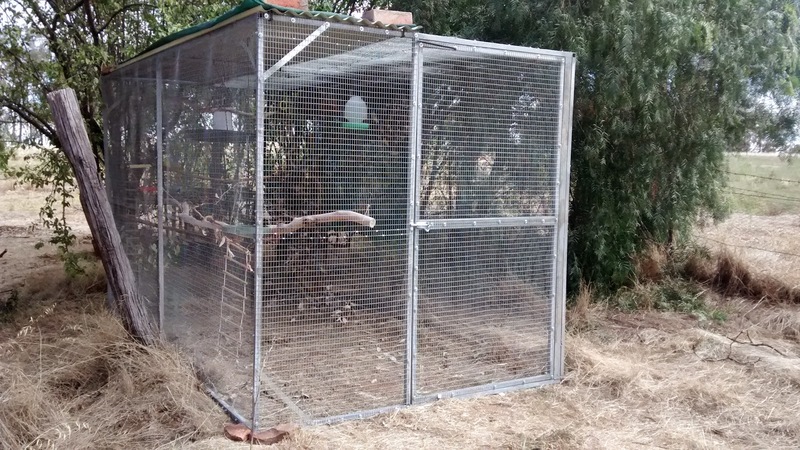 We positioned the aviary so that it gets some morning sun, but only dappled light around lunch, and is fairly shaded by the afternoon. It's one of the most wind protected areas of the entire property, and has a feeling of calm about it. We can also see it from the window that will one day be our bedroom. Marty and I both hope they enjoy their new home! Pip and Squeak are beautiful. They are lucky birds to have such a nice home. You did a bang up job on the Aviary.